As someone who has spent a lot of time in and around Coventry in the last few years, I can sincerely congratulate the city on becoming Government’s designated ‘UK City of Culture 2021’. I can also predict with absolute confidence that the city will make a success of the title. 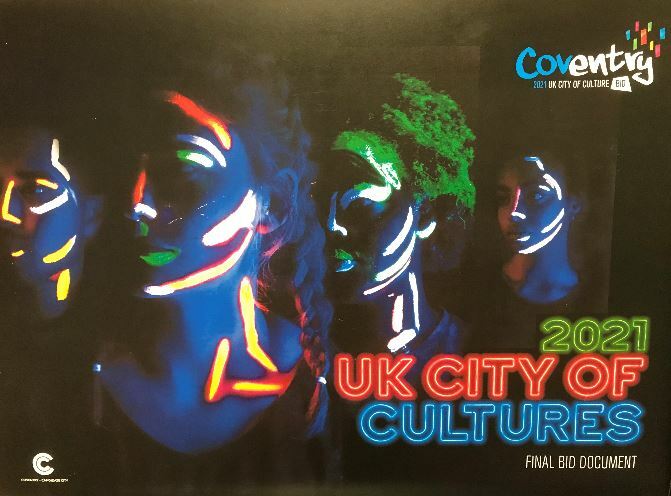 However, coming in the immediate aftermath of the determination that UK cities cannot be European Capitals of Culture in 2023, Coventry’s success raises some uncomfortable issues. A serious UK Capital of Culture-designate needs to surface, explore, and try to resolve these. I hope Coventry will rise to the challenge. Let’s get the superficial EU Commission point out of the way – although it does have some read-across to the wider argument. There have been allegations of EU unreasonableness, and some sympathy for the candidate cities – Belfast and Derry, Dundee, Leeds, Milton Keynes and Nottingham. However, it seems to me entirely reasonable for UK city proposals to be put to one side pending the firming up of Brexit departure arrangements. To be a ‘capital of Europe’ designated by the EU, you surely need to be able to guarantee unfettered access to all European citizens. Thanks to our Government’s ‘human shield’ hostage tactics with EU citizens, as of December 2017 we cannot do this. There is a further moral argument in that vein for Milton Keynes and Nottingham – both of whose electorates voted explicitly to sever those ties. To credibly present themselves as ‘European’ capitals of ‘culture’ requires a dramatic and unequivocal rejection of their own electorates’ preferences. Given the now known providence of the Leave campaign and its major UK and global advocates (that’s ‘адвокат’ for our Russian readers), bold city leaders could feasibly have had their humble pie and eaten it, but I don’t think either MK or Nottingham did. As one would expect, our national Government had neither the wherewithal nor the humility to do this for the UK as a whole. This brings us to the UK designation. My delight for Coventry is tempered by the identity of the patron, the character of UK ‘culture’ the patron represents, and the means by which their patronage was bestowed. Why is ‘City of Culture’ designation within the effectively unaccountable gift of the DCMS Secretary of State? I recognise she is advised by an Advisory Panel, but who selects and supports that panel? A culturally innovative Government would have created a much more imaginative product than ‘European capital-lite’, and a more interesting, independent process for selection of the winning city. Second, we need some honesty (and, yes, the aforementioned humility) on the prevailing UK ‘culture’ and values our minority, divided government, propped up by the DUP, projects. Can they claim an inclusive, progressive, forward-looking cultural character in any manner at all? It all feels too much like Trump awarding ‘Muslim Community’ or ‘Gun-restriction regulations’…of the year! Third, the selection of Coventry over Paisley, Stoke, Sunderland, and Swansea does raise interesting questions about economic rebalancing. Coventry is by some distance the largest, richest, youngest, fastest growing, and nearest to London of the five short-listed candidates. It is at the heart of key investments by Government’s industrial strategy, and post-HS2 will be less than an hour from the capital. It is a founder member of the West Midlands Combined Authority, with two major devolution agreements, led by the recently elected Tory flagship for metro-mayors. If one strips out that slightly bad after-taste, what might be key dimensions of a successful City of Culture 2021 for what is a great, and could be even greater, city like Coventry? Again, this is not the place for a forensic cultural prognosis – and I am sure the Coventry proposals have done that imaginatively and persuasively. But I would like to finish with the Brexit issues that Coventry’s designation raises. Coventry – like Stoke, Sunderland and Swansea (but NOT Paisley) – voted with BoJo, Gove, Farage and their assorted backers on June 23 2016. That carries the weight of ‘left behind’ communities in a city with two large top 15 UK universities, over 50,000 students, some of the most advanced engineering (research and business) in the world, and genuine credentials for global reconciliation after the horrors of WWII. For me, the measures of Coventry’s success in the coming years will not be the financial investment, the economic boosts, or even any physical legacy of designation – as welcome as these might be. A Coventry that is globally and nationally admired for its tolerance and inclusivity across all of its communities; looking outwards and forwards with confidence rather than blaming its challenges on migrants, Westminster, the EU, anyone else…a Coventry that acknowledges openly how the city and the country made a huge error of judgement in 2016 when it backed Bojo and his non-Dom media and business friends. The fight-back against what this country has become since the referendum will take many forms. My pleasure at Coventry’s success will be immeasurably enhanced if the whole city uses City of Culture 2021 to place itself at the forefront of that fight-back. And we will all enjoy the irony that it all came from a piece of patronage from the smallest department of this culturally-zombie government. Whilst future generations should send BoJo, Gove, Farage and their cultural values “to Coventry” in the traditional, colloquial sense, the City of Culture 2021 can give the idiom a whole new and positively exuberant meaning. « GE2017 – Democratic renewal or a further indicator of the UK failing state?